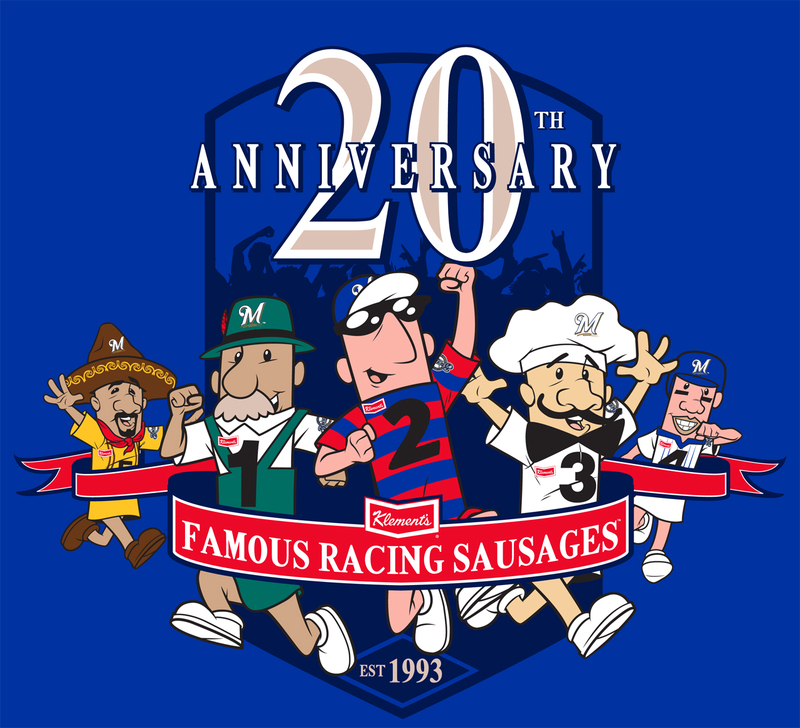 Today, the Brewers' Famous Racing Sausages celebrate their 20th Anniversary. 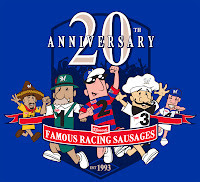 On Thursday, June 27, 1993, the sausages graduated from an animated cartoon on County Stadium's old black-and-white scoreboards to a live costumed event. Back in those days, there were only three sausages; Italian, Polish and Bratwurst, who won that inaugural race. They were later joined by the Hot Dog and Chorizo. Milwaukee baseball was chock-a-block with costumed mascots that year; a costumed Bernie Brewer had just started cheering on the Brew Crew from his new Chalet installed high above the bleachers. But Bernie wasn't the first, either. That's skipper Charlie Grimm with a six-foot version of Owgust, the original Barrelman, way back in 1942. 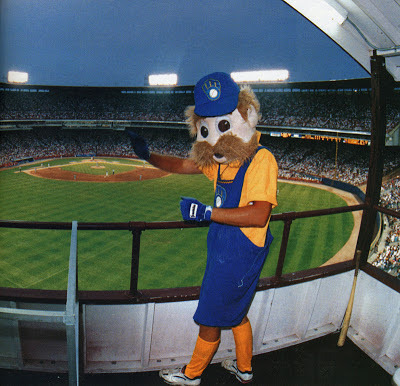 I'd love to see him make a return to the ballpark, perhaps as a new incarnation of Bernie Brewer (the current mustachioed one has been that interesting to me). Can you imagine him going down the slide? Mascot logos are the best. 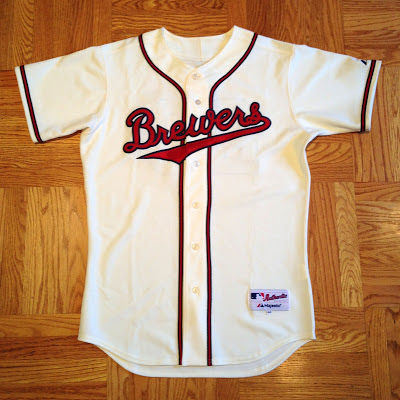 Following up on yesterday's review of the Brewers' 1948 throwback caps, today we're going to look at Majestic's contribution to the Turn Back the Clock event, the throwback jerseys. 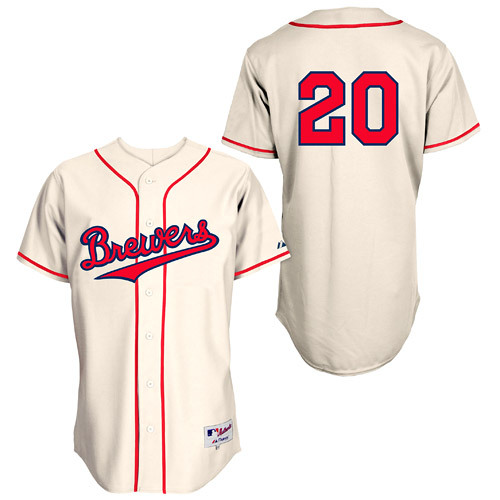 Specifically, a retail version customized with the number of catcher Jonathan Lucroy. The jersey features the elegant "Brewers" script wordmark introduced in 1942 set against a cream-colored polyester. 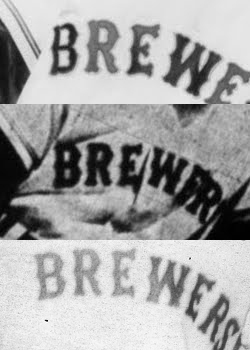 This appears to be the preferred way to replicate a sense of flannel in most cases; the Brewers' 1913 throwback uniforms used exactly the same base color. 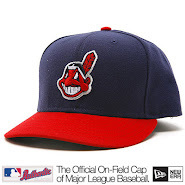 The initial Photoshop mockups on MLB's online store were not entirely accurate. They showed, and continue to show, simple red piping on the placket and cuffs. 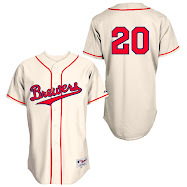 Fortunately, the actual retail jerseys include the blue/red/blue piping of the originals, reflecting the team's association with the Boston Braves. On the back, no name. Just simple block numbers in red trimmed with navy. It's a beautiful design, classic baseball. 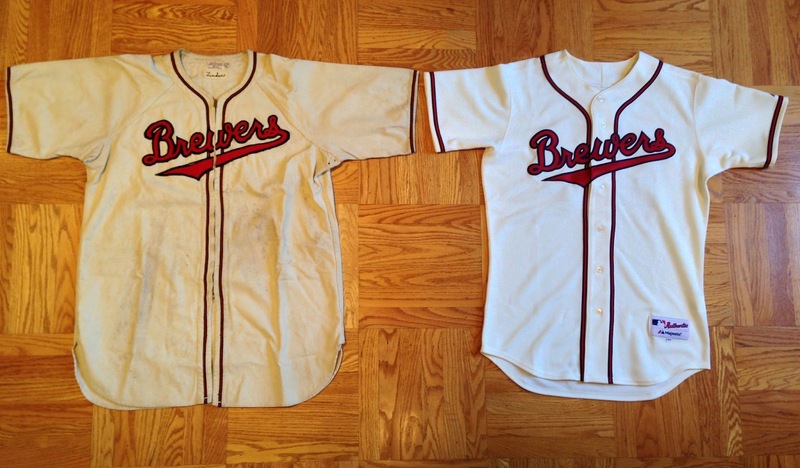 But how authentic is it to the original jerseys our Brews wore in 1948? When we compare this jersey to the vintage 1948 Walt Linden jersey, we can see exactly how well they did. The first thing that jumps out is the zipper. A staple of the original club's jerseys (every jersey they ever wore with "Brewers" on the chest had one), it's been replaced here with Majestic's standard six-button front. The button-placket also means that the piping is slightly wider than on the original. Majestic also decided to use set-in sleeves rather than the original's raglan. Strange, since the Brewers use raglan sleeves on all their modern jerseys. But that's where the nitpicking ends. 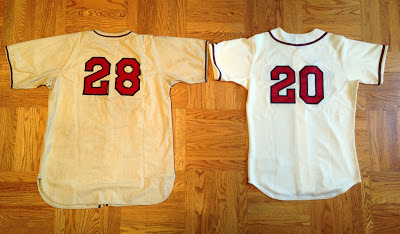 Other than that, it's a remarkably faithful reproduction of the original, down to the number style. Curious that they didn't include the ever-present batterman logo found on the back collars of all modern jerseys, especially since New Era put it on the backs of the caps. I just can't get enough of that wordmark. Amazing. Kudos to Majestic for a job very, very well done. These are still available on MLB.com - get 'em while they're hot. 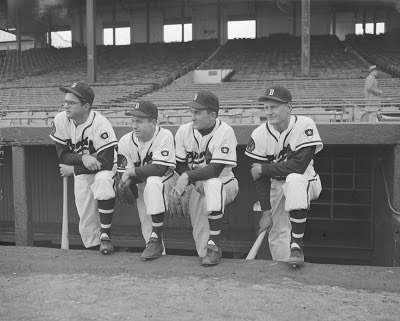 One final note on this 1948 Turn Back the Clock event; I'm still somewhat surprised that the Twins had almost no "St. Paul Saints" throwback merchandise available online. The visiting Brewers were much more well-represented. I'd like to believe that indicates a sense that Milwaukee fans are interested in their city's baseball history, but it's puzzling nonetheless. 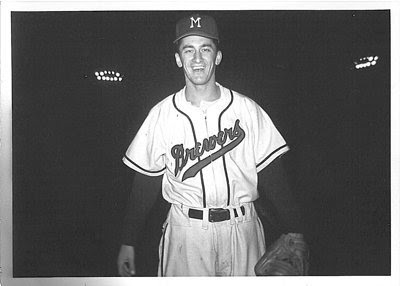 For the Brewers/Twins throwback game last month in Minneapolis, Majestic and New Era outfitted the teams in 1948-style uniforms. We're going to look at those uniforms over the next few days, specifically the retail versions, to see how well they recreated the period style. 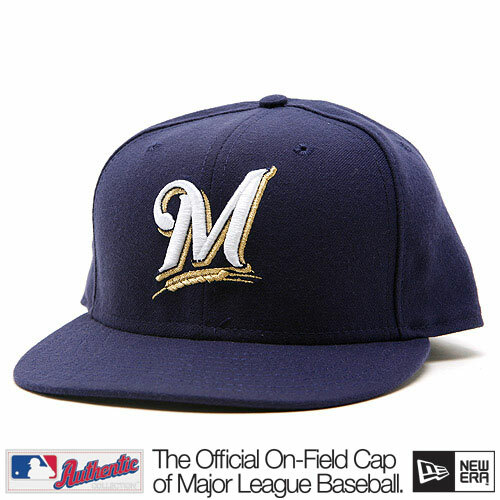 First up, we have the Brewers' throwback caps manufactured by New Era and available on MLB's online store. Blue cap, red bill & squatchee, white block "M". Simple and bold. 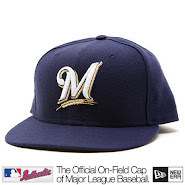 It's a gorgeous look, obviously most commonly associated with the Milwaukee Braves but actually introduced by the Brewers as a nod to the similar cap worn by their parent club in Boston. 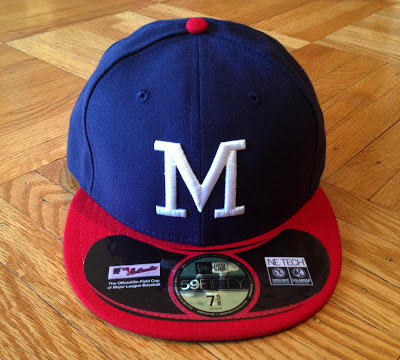 This cap was introduced in 1948, when the team's traditional sans-serif red letter was replace with a white block "M". 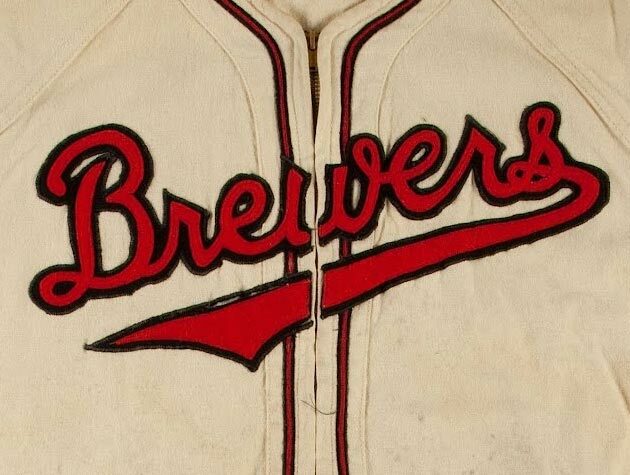 With minor variations to the monogram, the style was worn through the Brewers' final game in 1952. 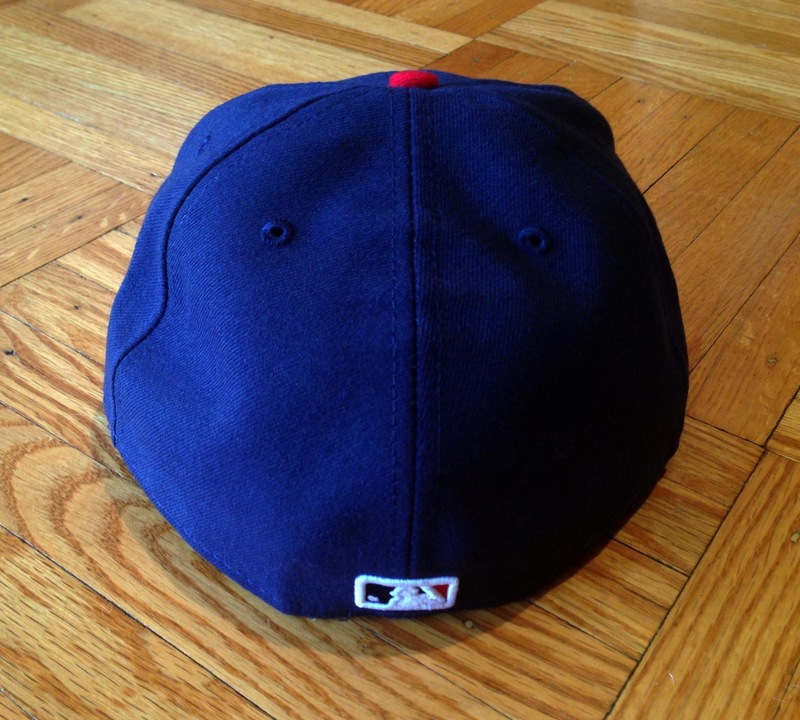 But how authentic is this 1948 throwback cap? First of all, there are the concessions to modern construction and specifications. 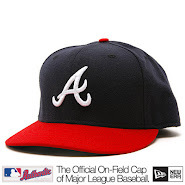 This cap was made in the United States of the relatively-new synthetic COOLERA™ fabric. It features a black underbrim and MLB "batterman" logo on the back. Obviously, neither of these elements would have been present on the originals, but I don't have a problem with including them here. 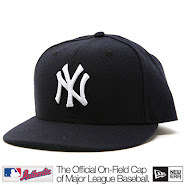 And no, I'm not going to keep that massive New Era sticker on the brim. That would be goofy. I present it here with the retail stickers intact, just as it came out of the box, to illustrate how these caps are sold. So that's the construction of our 1948 reproduction. But how close the style of this cap comes to the originals is worth exploring in detail. 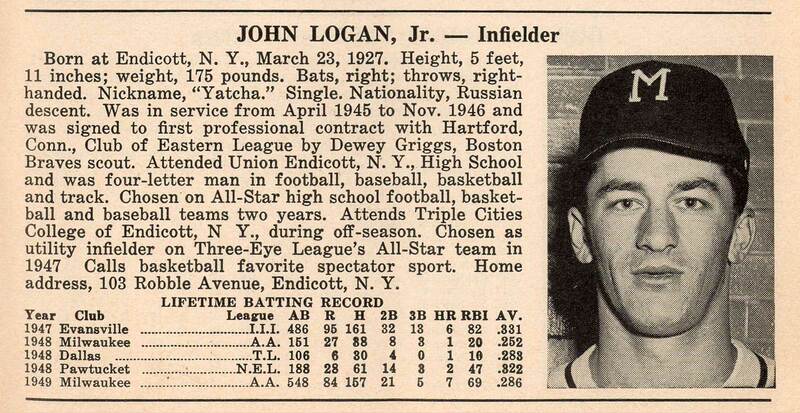 This photo of Brewer shortstop Johnny Logan, from the 1948 edition of Who's Who in the American Association, gives us an excellent look at the original period caps. With that in mind we can evaluate New Era's reproduction. The first thing that jumps out to me is the color. The navy seems a little light. 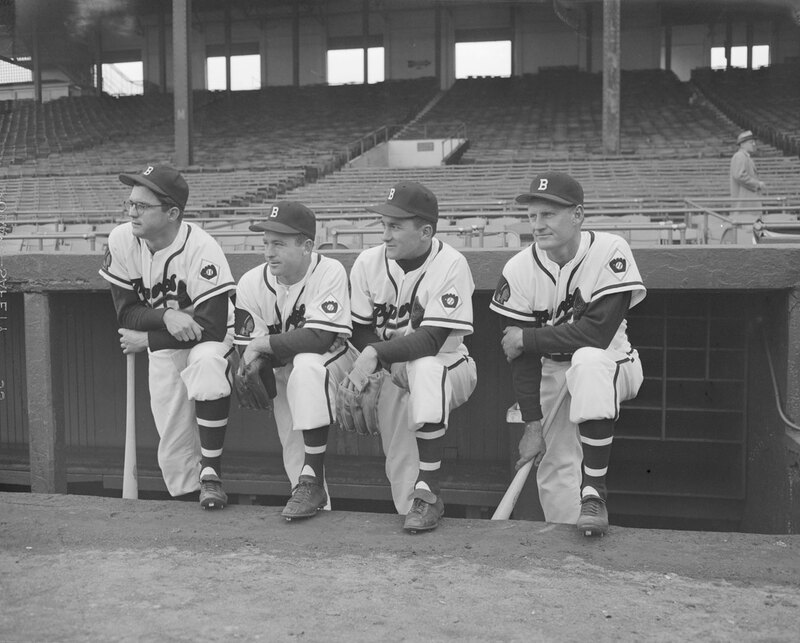 I suspect the original Brewer cap in 1948 was closer to the Braves' midnight navy than the Indians' lighter shade. 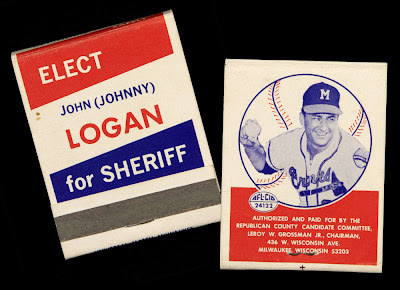 That would seem to be backed up by the vintage 1948 jersey in the museum's collection, a jersey trimmed in a blue so dark that the original auction catalog listed it as "black". 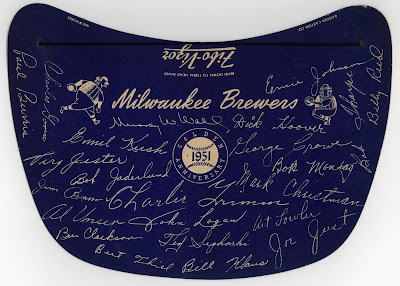 Even accounting for the age of this jersey, the Brewers' shade of blue at the time was clearly very dark. New Era's midnight navy would probably have been a better match. Which brings us to the "M". 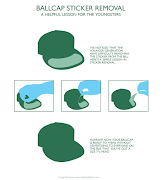 New Era has an ongoing problem with this logo, everywhere it appears. 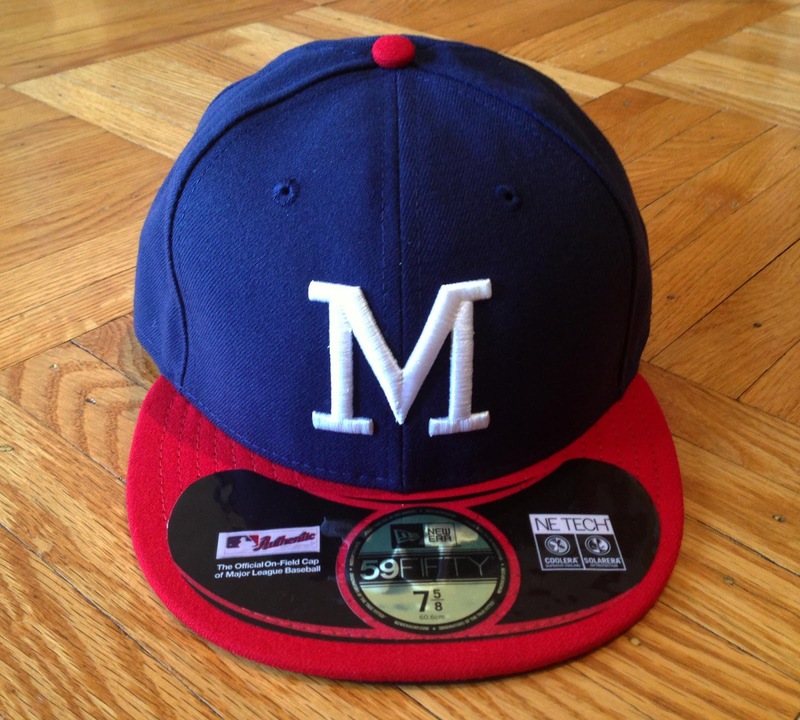 I don't know if the problem lies with the Cooperstown Collection style guide, or if it's just bad work on the manufacturers, but their "M" has never been right. The letter should be significantly taller than it is wide, but for some reason in recent years we've seen nothing but squat, square "M"s on reproduction caps. 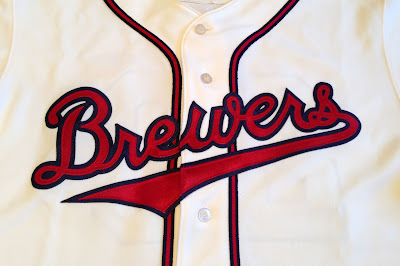 This modern style is especially incongruous when compared with the logo worn by the Brewers in 1948. 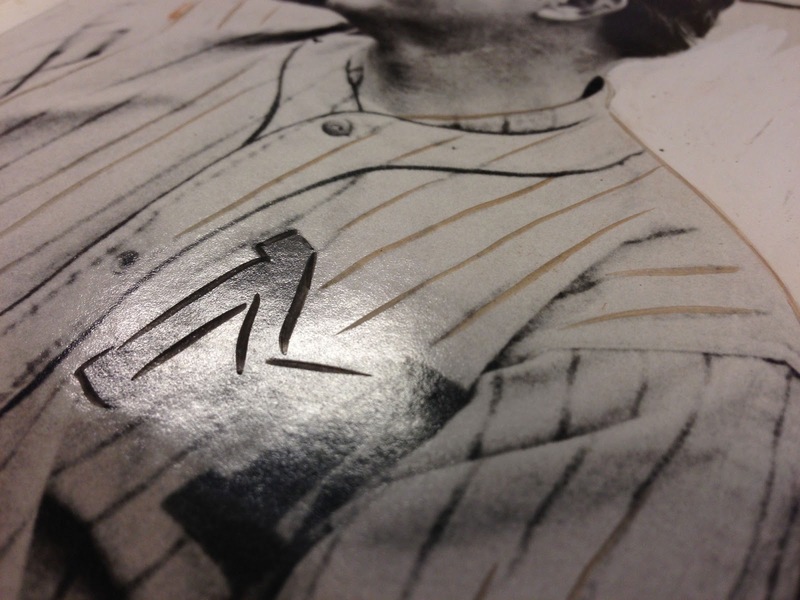 Later seasons would see the exact same "M" made famous by the Milwaukee Braves, but in its first season, the letter was particularly narrow. Compare the square New Era monogram with this photo of catcher Walt Linden, also from the 1948 edition of Who's Who in the American Association. So, on balance, how did New Era do? 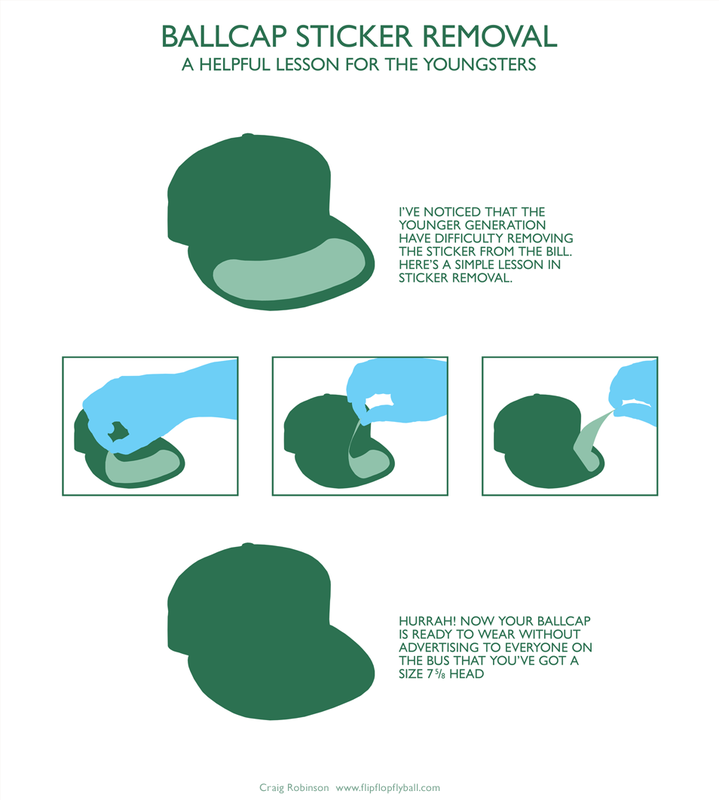 Their reproduction 1948 cap is good with all the broad strokes, but just misses on the details. Still, it's a fantastic design, and well worth picking up while you can. 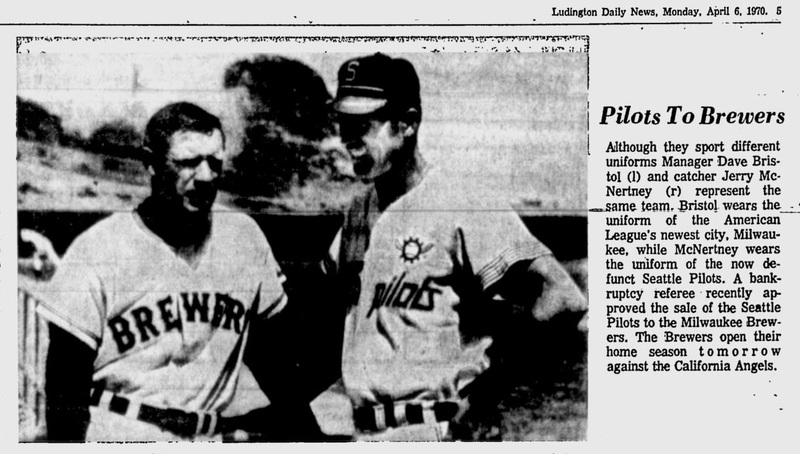 This AP wire photo from 1970 recently turned up on eBay. MILWAUKEE, WIS., April 6—Player John Kennedy and airline stewardess Barbara Heimann enter Milwaukee airport as Milwaukee Brewers made first appearance in the city since moving from Seattle. Miss Heimann wore a brewers uniform. 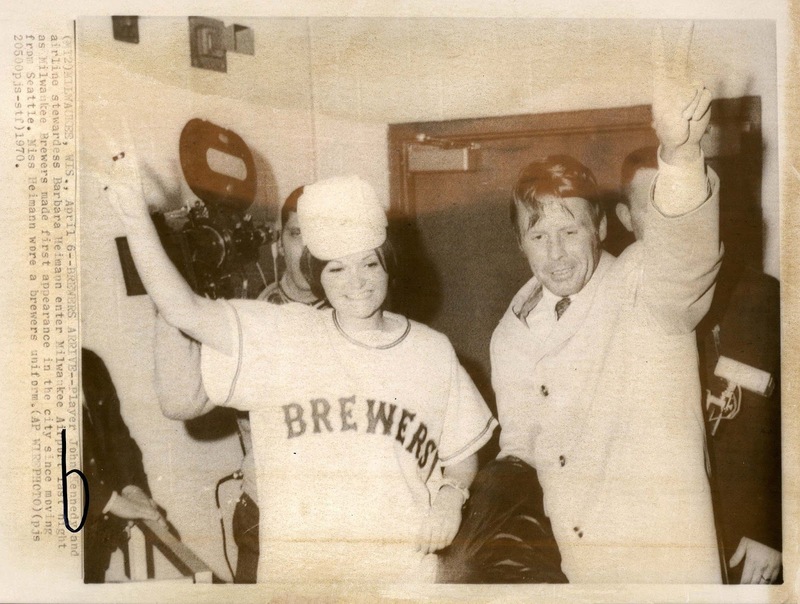 We've discussed in some detail the jersey Ms. Heimann is wearing; it is the prototype briefly used by the Brewers in the heady days after a Washington court allowed Bud Selig to buy the bankrupt Pilots and move them to the Cream City. 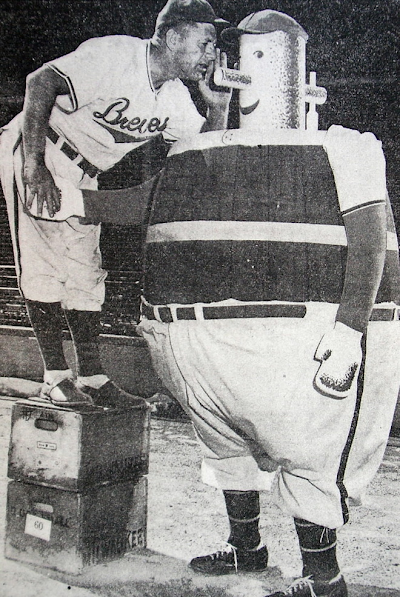 You might remember that when Selig formed his group to bring baseball back to the Cream City, he borrowed the name and mascot of his boyhood team. 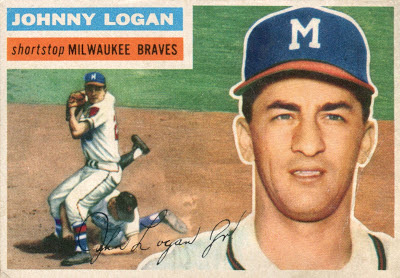 This particular jersey was actually the second prototype; the first was a pinstriped number displayed in the window of College Athletic sporting goods on Plankinton Avenue in downtown Milwaukee to raise interest before the Pilots' sale and move was even approved. 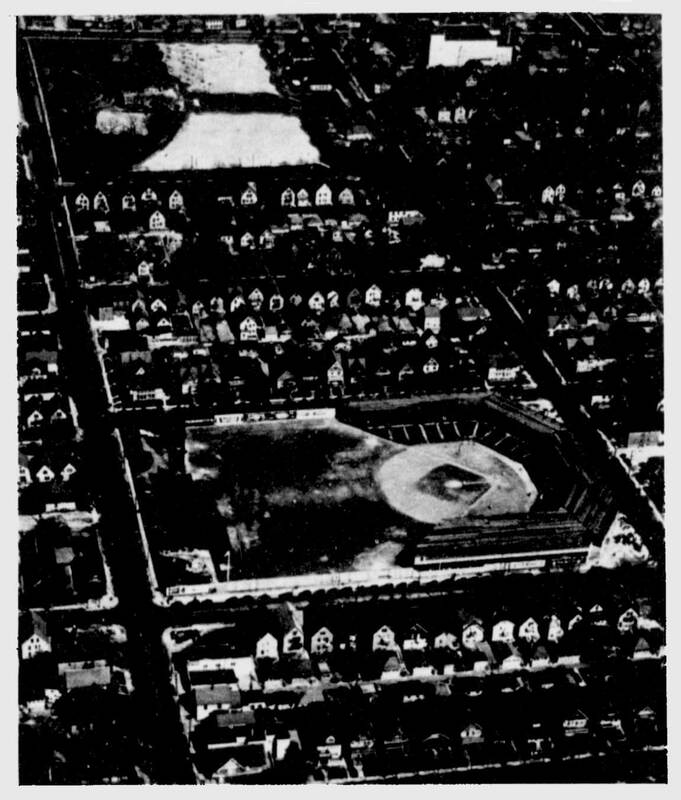 BREWERS' BACKER — Wearing a Brewers' uniform, airline stewardess Barbara Heimann, Chicago, gave a victory sign shortly after the plane carrying the team arrived at Mitchell Field. 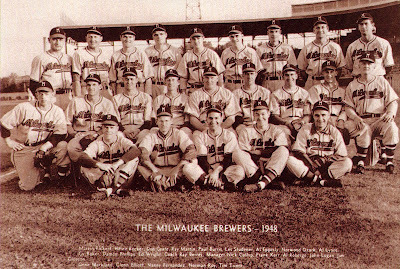 This wire photo brings to five the total number of pictures we currently have of this jersey, all taken within the span of less than one week as the newly-minted Milwaukee Brewers were scrambling to prepare for rapidly-approaching Opening Day. 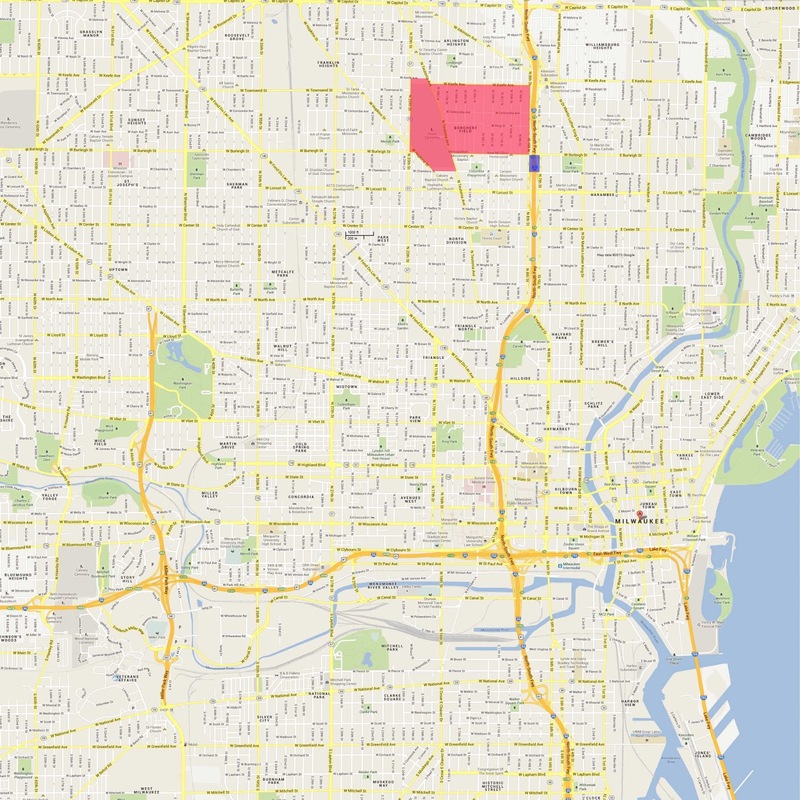 I'd like to put all five photos here, in one place, so we can create as complete an image of the second prototype as possible. 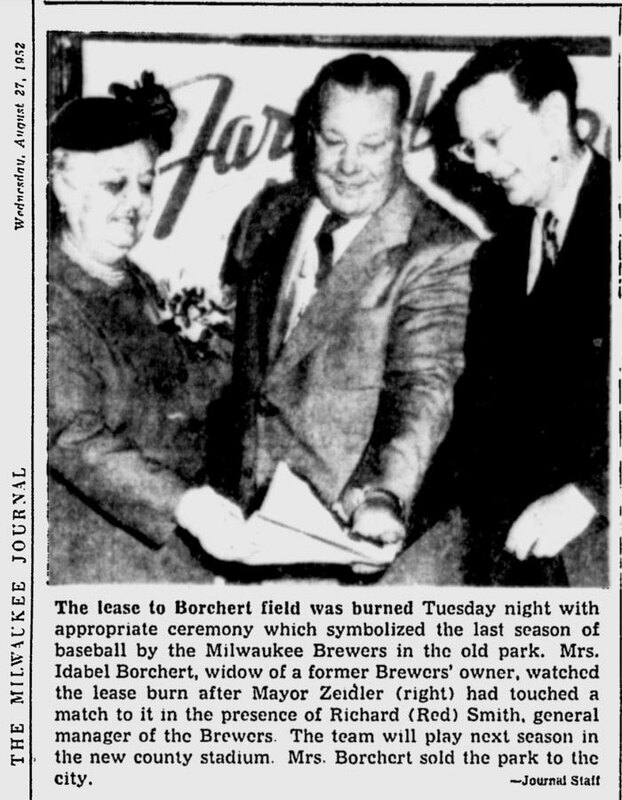 The first two extant photos were taken at Mitchell Field as the Brewer players arrived at their new hometown. While the AP photographer above was capturing Ms. Heimann and second baseman John Kennedy entering the Mitchell Field terminal, a Milwaukee Journal shutterbug, crouching down, was capturing the same shot, Ms. Heimann staring right into his lens. 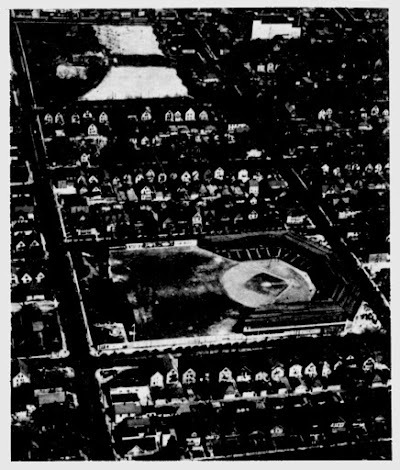 Same raised arm, same V-for-victory salute (rather ironic, since Milwaukee's return to the majors was coming in the person of a truly dreadful team barely removed from its expansion roots). 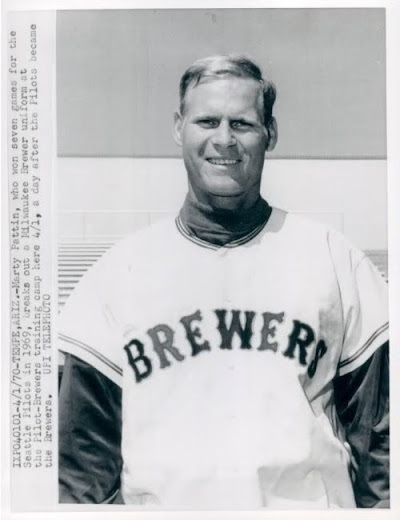 TEMPE, ARIZ.—THE NEW AND THE OLD—Manager Dave Bristol models one of the new uniforms his team will be wearing now that the Seattle Pilots have become the Milwaukee Brewers. 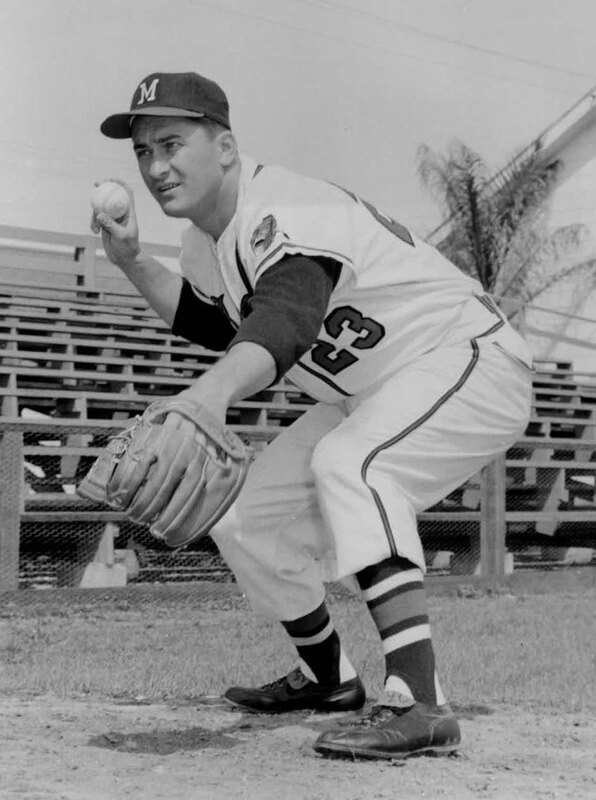 Catcher Jerry McNertny wears one of the old uniforms. 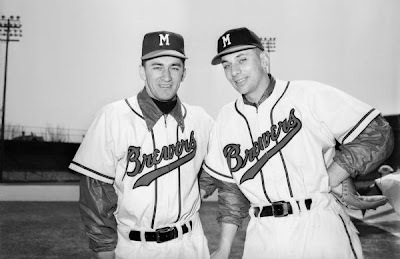 Although they sport different uniforms Manager Dave Bristol (l) and catcher Jerry McNertny (r) represent the same team. 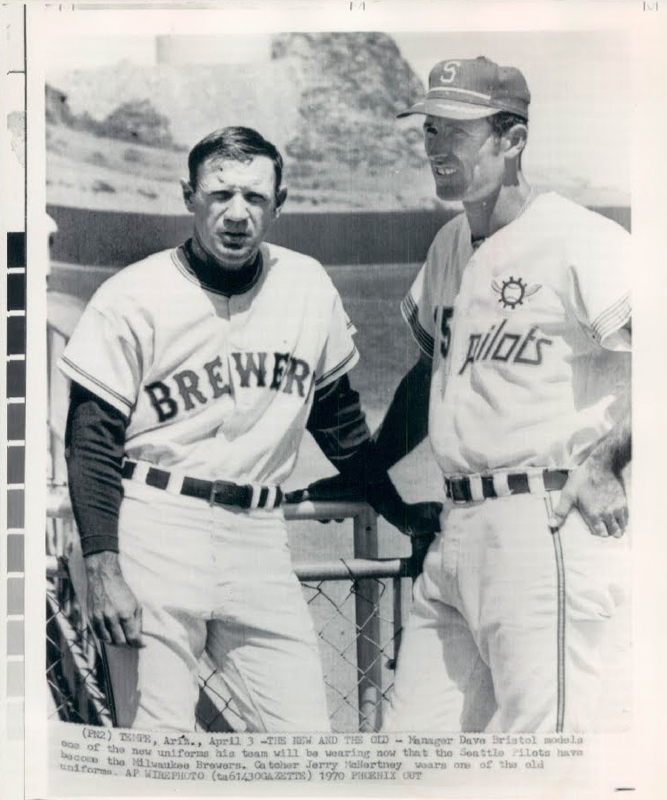 Bristol wears the uniform of the American League's newest city, Milwaukee, while McNertny wears the uniform of the now defunct Seattle Pilots. A bankruptcy referee recently approved the sale of the Seattle Pilots to the Milwaukee Brewers. The Brewers open their home season tomorrow against the California Angels. TEMPE, ARIZ.—Marty Pattin, who won seven games for the Seattle Pilots in 1969, breaks out a Milwaukee Brewer uniform at the Pilot-Brewers training camp here 4/1, a day after the Pilots became the Brewers. 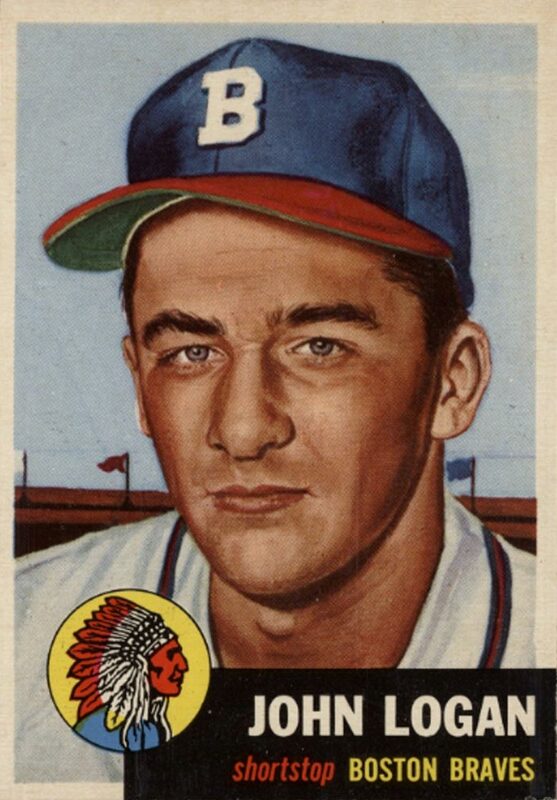 The caption is kind to ol' Marty: he won seven games for Seattle but lost twelve. Milwaukee would be good to him for the two years he spent there, first doubling his win total in 1970 for a 17-12 record, and then following it up in 1971 with an even 14-14 mark. 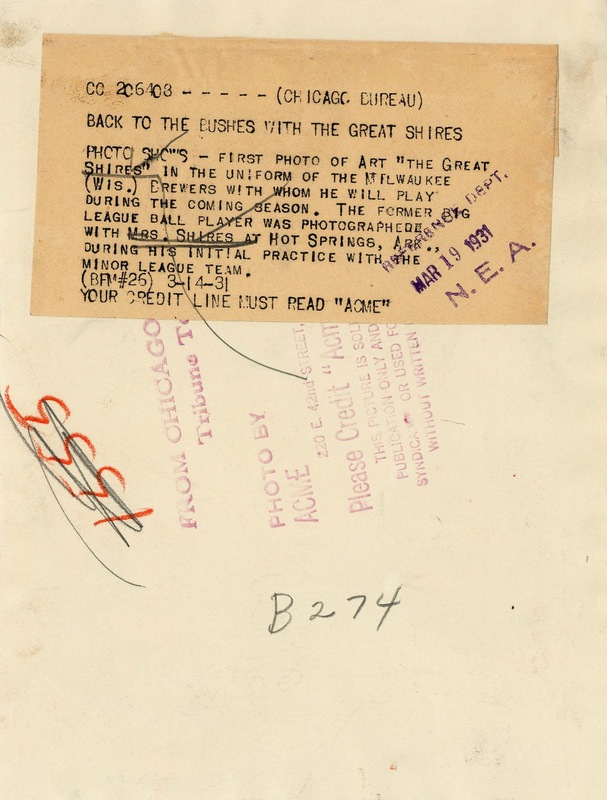 Adding this new wire photo to the mix, I'm more convinced than ever that there was only one prototype of this style made, passed from Pattin to Bristol to the flight attendant so they could display it for the cameras. We still don't know what the color scheme was. A reader was able to confirm that the Brewers' first prototype, a pinstriped number created before the Pilots' sale was official, was the blue and red of our American Association Brewers. This second prototype looks more like blue and gold to me, but we can't be sure. 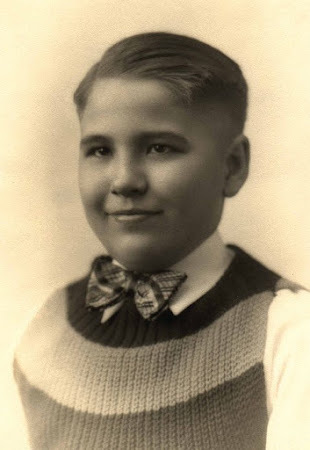 In honor of Father's Day, I'd like to share with you this story told to me by reader Sue Bosman about her dad, Bobby Parron, and the times he spent at the Orchard when he was a boy. I wanted to share a little memory my dad told me before he passed away. 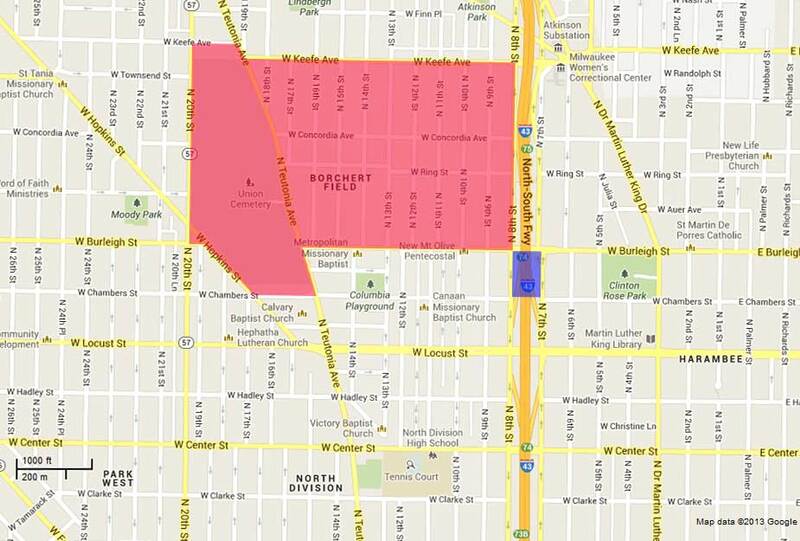 He lived on 10th and Locust, just a block or two from Borchert Field. This was from around the early 1930s or so. He used to watch the game through the knot holes, but when fans came to park their cars there, as a little kid, he would say "Hey mister, I'll watch your car for a nickel." They would say sure and give him a nickel. He kept doing this to car after car until he came up with enough money to buy himself a ticket to the game. On a side note, my grandmother (dad's mom) was an entertainer at a roadhouse in Milwaukee during the 1920s. It was a well known roadhouse where celebrities, sports figures and various well-known people of the time went. 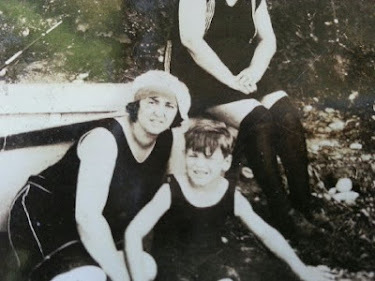 Grandma became friends with many "regulars" there including Babe Ruth. She became good friends with Babe, enough to call him by his name "Herman", which he preferred as he did not like his first name. 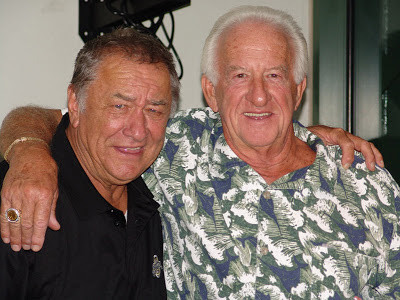 When Babe was in the area for a game, he would golf at Bluemound Country Club during the day, and at night he would come into the roadhouse with his golfing attire on. I asked grandma if she got his autograph and she indignantly said "Friends don't ask friends for autographs." 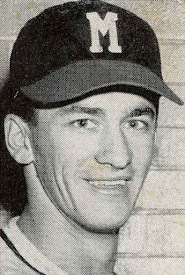 Grandma had many nice things to say about Babe, including that he was "a real big tipper" and a really happy, personable guy who enjoyed to eat and drink. And "when Al Capone came in there with his people, if he asks you to dance, you dance." I know it's short, but it's a memory that I wanted to contribute. I'm so glad you did, Sue. Thank you. Personal stories like these bring real human life to a field of study quick to sink into sepia-toned photographs and dry statistics. 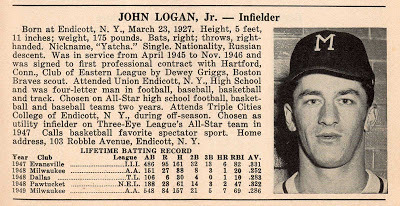 In our detail obsession, it's easy to lose sight of the men who actually played the game, and the men, women, and especially children who loved it. 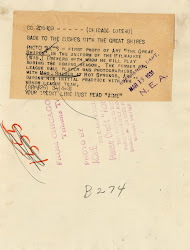 Inspired by Sue's contribution, I've started a new tag – "PERSONAL REMEMBRANCES" – to catalog stories like hers. 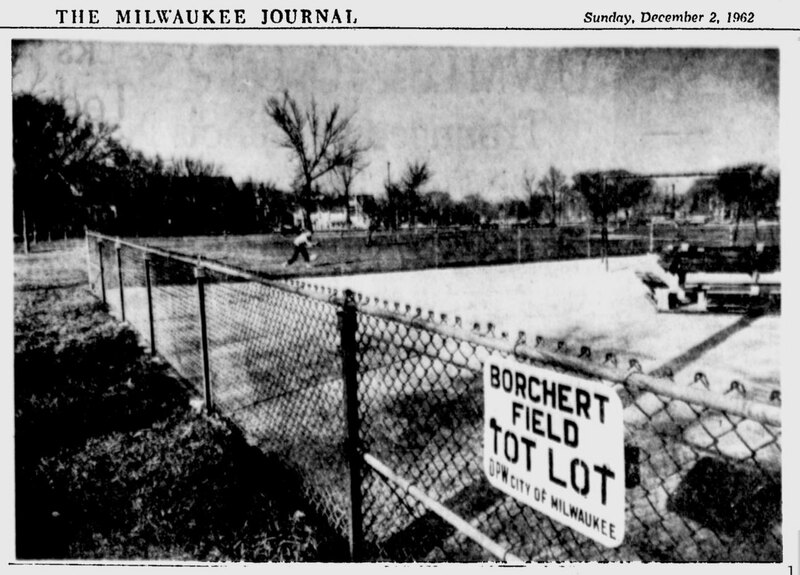 If you have a memory surrounding Borchert Field that you'd like to share, drop me a line. We'd love to hear from you. This Acme wire photo gives us another look at Charles Arthur Shires, also known as Art "the Great" Shires, also known as "Whattaman" Shires. 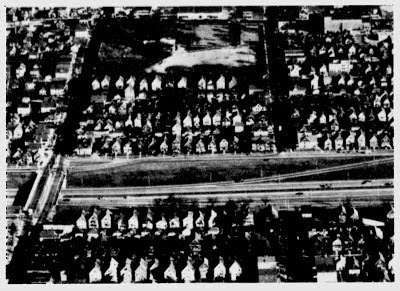 Shires was profiled by Paul Tenpenny three years ago, but this photo is new to us. 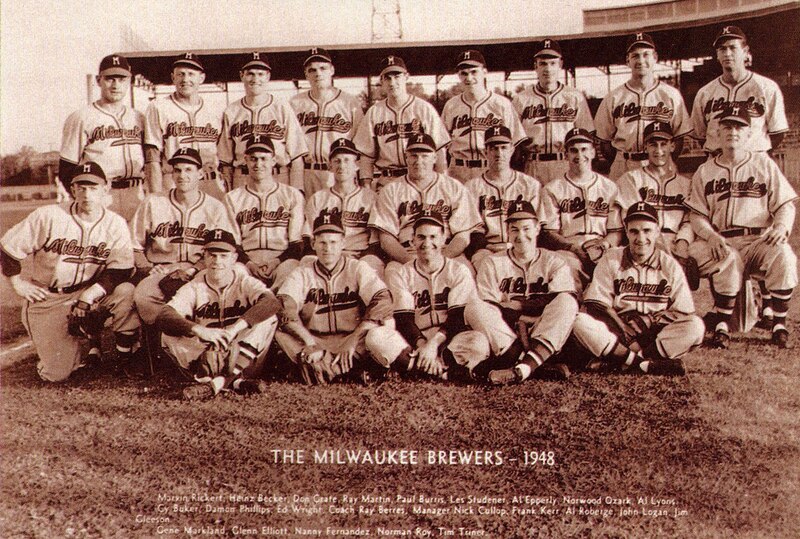 PHOTO SHOWS – First photo of Art "the Great Shires" in the uniform of the Milwaukee (Wis.) Brewers with whom he will play during the coming season. 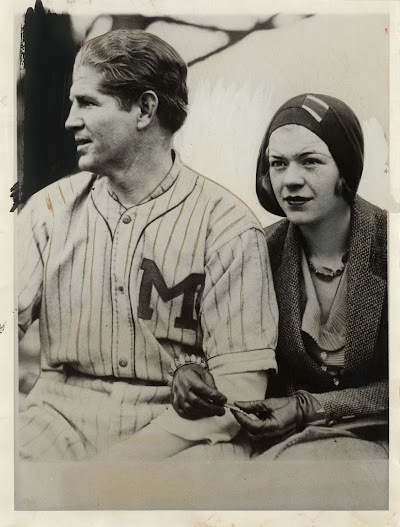 The former big league ball player was photographed with Mrs. Shires at Hot Springs, Ark., during his initial practice with the minor league team. Art is looking pretty sharp in his pinstriped 1931 Brewer uniform. I also love the cloche hat Mrs. Whattaman is wearing; very Jazz Age. She was Elizabeth "Betty" Greenabaum, an 18-year-old student at the University of Wisconsin. They were relative newlyweds when this picture was taken, having been married the previous November 7th in Los Angeles, where Shires was spending the off-season working as an actor. Shires had been traded from the Chicago White Sox to the Washington Senators during the 1930 season, but the rowdy ways that sent him out of the Windy City also caused him trouble with Clark Griffith. Washington sold him to the Brewers on December 1st, 1930, for a reported $10,000. 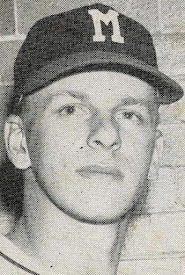 "Shires," Griffith was quoted as saying, "is the best ball player I have ever sent back to the minors." If they were hoping that marriage would settle him down, early indications weren't promising. After the ceremony, Shires joked around with the reporters covering him. "Now, I've got a wife, and I'll need more money. Guess I'll have to be a hold-out next spring." 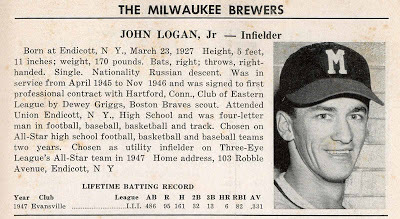 He called his courthouse wedding "batting practice", suggesting that "there will have to be a church wedding later, although I’d rather face that great pitcher 'Lefty' Groves [sic] than do this over again." A lost art, replaced by the impersonal hand of Photoshop.